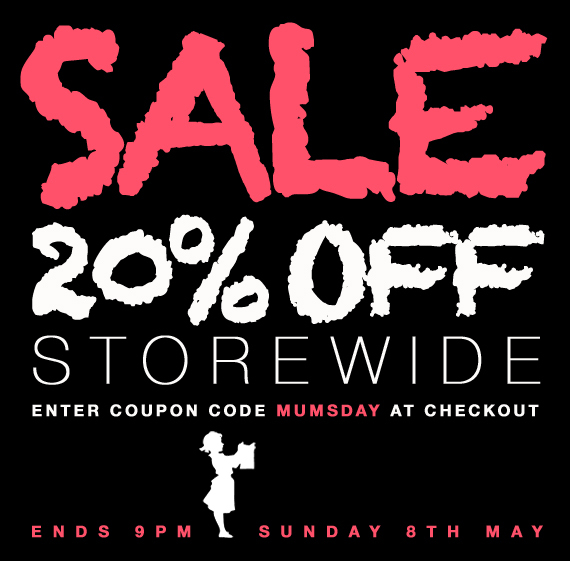 PS The Table Tonic 20% off storewide sale ends at 9pm (AEST) tonight - Don't miss out! And I'll give you a hot tip: There won't be another one for a while, so if there's something you've had your eye on, grab it now! PPS The 20% off applies to pre-orders as well. Happy shopping and most importantly, Happy Mother's Day! such a sweet image, Louise! Happy Mother's Day to you too! Happy Mother's Day to you too Louise. Can't wait to see your Mother's Day pics. I was lucky yo get from my Indians a beautiful new white Mac which I am typing on now. Searching digg.com I noticed your blog book-marked as: Blogger: Table Tonic. here? I'd really love to be a part of online community where I can get opinions from other knowledgeable people that share the same interest. If you have any suggestions, please let me know. Appreciate it! question that I'd like to ask if you do not mind. I was interested to know how you center yourself and clear your thoughts prior to writing. I have had trouble clearing my mind in getting my thoughts out. I truly do take pleasure in writing but it just seems like the first 10 to 15 minutes are usually lost just trying to figure out how to begin. Any recommendations or tips? Kudos! It's an remarkable paragraph in favor of all the web viewers; they will get benefit from it I am sure. wide for me. I'm having a look ahead for your subsequent put up, I'll attempt to get the dangle of it! particular submit amazing. Wonderful process! Such clever work and exposure! Keep up the awesome works guys I've added you guys to my personal blogroll.